Last weekend, Brad and I were supposed to go to a pot luck. Meanwhile, I had been up since 6:00 AM preparing and executing a baby shower. I was in no mood to cook when I got home. I just wanted to go on a nice walk and put my feet up. Brad suggested we pick up something from the Teeter. But fancying myself a food writer and recipe developer, I feel really lame showing up to a party with pre-made stuff from the grocery store. So I took the massive amount of spicy pimento cheese leftover from the shower (Brad’s recipe makes a vat) and put it to good use by combining it with about 2/3 box of macaroni (after boiling it) to make Mac n’ Spicy Pimento Cheese. It was super easy and didn’t need any milk or cream because of the mayo — just combine the cheese with the hot macaroni and continue to stir with the stovetop on low, then back on 350 for 20-30 minutes if you (not necessary). It was a huge hit. Definitely something I’ll made again and again. But this post isn’t about that. It’s about what I did with the rest of that box of macaroni. 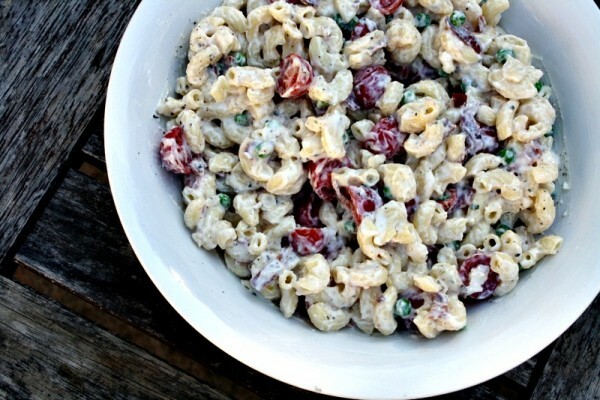 I love pasta salad, but I’m so picky that I rarely ever order it. 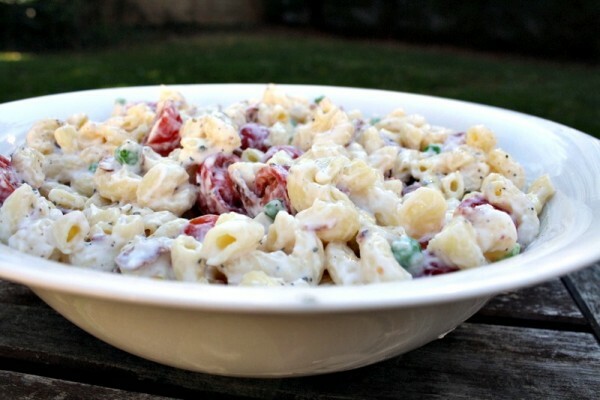 The best pasta salad I ever had came from a restaurant in my hometown that closed when I was in high school. Sad face. I also love ranch. Ranch dressing. Ranch dip. I only eat it every once in a while because it’s so fatty and the light version has this yucky sweetness that just isn’t right. But I recently learned that I could make ranch dip by taking some of the Hidden Valley powder and combining it with fat free Greek yogurt. And it actually tastes good! I’ve also added some skim milk to thin it out to make a dressing, which usually requires more of the mix so the flavor isn’t diluted. And here’s where the pasta salad comes in. Yes, I’m finally getting to the point. 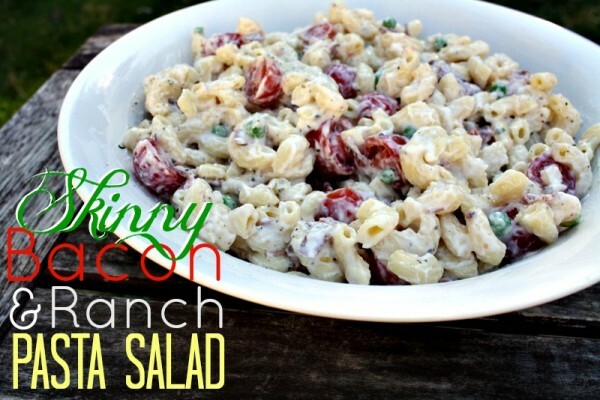 I made ranch pasta salad by simply combining Hidden Valley Ranch Dressing and Dip Mix with fat free Chobani, mixed it with cooked macaroni, then added cherry tomatoes, turkey bacon, and green peas (pasta salad always needs peas). For those of you who need more exact directions, keep reading. 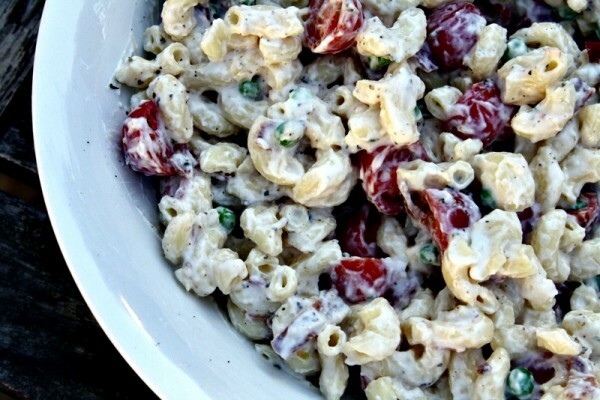 If you're a lover of ranch dressing and dip, you'll love this take on traditional pasta salad. 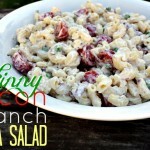 It has all the creaminess of the usual pasta salad with very little fat And you know bacon makes everything better. Boil pasta in salted water according to package directions. Drain and set aside. In a pan or skillet, cook turkey bacon until crispy on both sides. In a medium sized bowl, combine the Greek yogurt and ranch mix. Add to pasta along with the bacon, tomatoes, and peas. Mix thoroughly. Salt to taste and mix again. Other "chunky" pastas like penne or bowtie would work great too. If you're a big fan of bacon, don't let me limit you to 8 pieces. Please add more! You can even reserve a few pieces, chop them, then sprinkle them on top for some extra crunch.